One of the highlights of the Pepperdine Lectures each year is getting to hear Dr. Randy Harris, a professor at Abilene University. Randy is a bit hard to explain. He is single, usually dresses all in black, and is the foremost theologian in our movement. And he is one of the funniest guys you’ll ever hear. 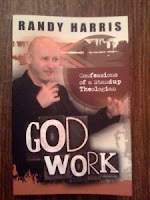 His new book is entitled God Work: Confessions of a Stand-up Theologian. And Harris knows how to combine the two (humor and scholarship) in a way I’ve never heard before. You are laughing all the way through his presentation, and then realize you have learned some things that are important. It is not often that the smartest guy in the room is also the funniest, but that is the case in most rooms that Harris occupies. Harris’ class this year was entitled “My Favorite Atheists: Conversing with the Enemy” and he did three presentations on what we can learn from Feuerbach, Sartre and Nietzche. It was very interesting. I remember reading these guys (when forced to in school) and I don’t remember it being particularly interesting. Perhaps I didn't read closely enough... but I passed the quiz.